In 60 games last season the Johnstown Tomahawks had a total of two shutouts. This season in the first nine games they have two. Coming into the season the Tomahawks were built for a high scoring team, but in the games they've played and got two points, they've shown to be a more defensive team. The way I see it, whatever gets the two points is good enough for me, as well as other Johnstown fans. Alex Okicki played as strong as you can in net, stopping all 28 shots he faced. The game winning goal came in the second period on the power play. It was scored by Jordan Watt. Jordan Watt would strike again in the third period as he was able to beat Soo's goaltender, Paige Skoog, on a pentaly shot. Johnstown went 1 for 5 on the power play. Soo went 0 for 5. 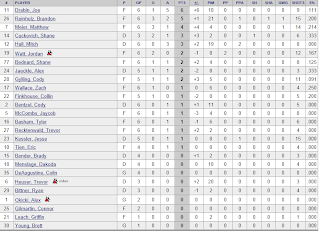 Both teams registered 28 shots on net. With the win Okicki's record goes to 2-2-0 with a GAA of 2.30 and a save percentage of .922. Alex is the first goalie to get his save percentage above the 90% mark for the season, which you'd like your goalie to be at. The Johnstown Tomahawks now have a record on the young season of 4-4-1 good for 9 points and second place un the division. After nine games last season the Tomahawks had a record of 3-3-3 good for 9 points. The Tomahawks are back at home this weekend vs. the Springfield Jr. Blues, a team that's in the North Division but that the Tomahawks don't play often. Springfield has a current record of 4-2-0 and are currently in third place, one point behind Johnstown. We are currently updating the Alumni stats and they should be updated within the hour of this posting. Check up on all the former Tomahawks here. Zach Wallace Scores in Seventh Round of Shootout, Johnstown Tomahawks Win 3-2. This is a very quick recap as I did not watch tonight's game. Yes, in fact there are a few games I do miss during the season. The Tomahawks battled from behind 2-0, to win the game in a shootout 3-2. Alex Okicki faced 28 shots and made 26 saves along with stopping all seven shooters in the shootout. Colin Brennan faced 39 shots and stopped 37. Johnstown was 1 for 7 on the power play. Soo went 1 for 10. Johnstown is now 3-4-1 on the season. The score of tonight's game doesn't really tell the story of how the Tomahawks played. Most of the night Johnstown was in charge of the game and held many of the scoring chances. That being said, because of a few soft goals, Johnstown sees themselves on the wrong side of the score. Colin DeAugustine started the game in net for Johnstown. In his last two starts he was able to turn away 46 of 47 shots faced against him. Tonight, he could only stop 7 of 10 shots which lead to him being pulled in favor of Alex Okicki. Okicki held the fort for most of the game and kept Johnstown within striking distance, facing 30 shots and making 28 saves. Jordan Watt scored on the power play with the assist going to Zach Wallace in the second period. The top line for Johnstown scored another goal for the Tomahawks to make the game 4-2. It was a Brandon Reinholz slap shot assisted by Joe Drabin and Matt Meier. That's as close as the Tomahawks would get to tying the game. Each team went 1 for 3 on the power play. There were no fights during the game, but many small scrums after whistles all night. Johnstown is currently 0-3-0 vs. the North Division this season. DeAugustine got the loss tonight. His record is now, 2-2-0-1 with a GAA of 2.99 and a save percentage of .875. For Soo, Paige Skoog picked up the win. His record is now, 2-0-0-1 with a GAA of 1.62 and a save percentage of .949. Johnstown and Soo play each other again tomorrow and Sunday. Jaycob McCombs has two penalty minutes for Roughing in his first game with the Wilderness so far tonight. He also has three shots. Bittner is not in the line up. Gylling has one assist for Amarillo so far tonight. Game is in third period, Amarillo winning 3-2. The Johnstown Tomahawks are back in action this weekend for a three game series vs. the Soo Eagles. This is the first time the two teams have met this 2013-2014 season. Both roster have changed from last season, and both teams have recently made some additions and subtracktions trying to get their rosters just right. A big storyline to watch this weekend is if Colin Brennan gets any starts for the Soo Eagles this weekend. Of course Johnstown fans know that Brennan played last season in Johnstown and was in Johnstown's camp this year before being released. Brennan has seen action in net with the Eagles this season, appearing in two games with a record of 0-1-0-1. He's GAA is currently 2.88 and he has a save percentage of .909. Ryan Urso who played for the Jamestown Ironmen last year is calling Soo his home this season. In four games so far this year, Urso has three points, and is a plus four. The Soo Eagles currently are tied for third place in the NAHL North division with Johnstown sitting in the second place spot by only a point. Soo has a record of 1-1-2 and Johnstown holds a record of 2-3-1 in this young season. Overall, Johnstown has scored 16 goals and has allowed 21. Soo has scored 7 goals and have allowed 11. On special teams, Johnstown comes into the weekend with the 21st ranked power play in the league. (There's a total of 24 teams in the NAHL.) Johnstown's penalty kill is ranked 20th overall, killing penatlies 75% of the time. That's a number that has been improving over the past few games. 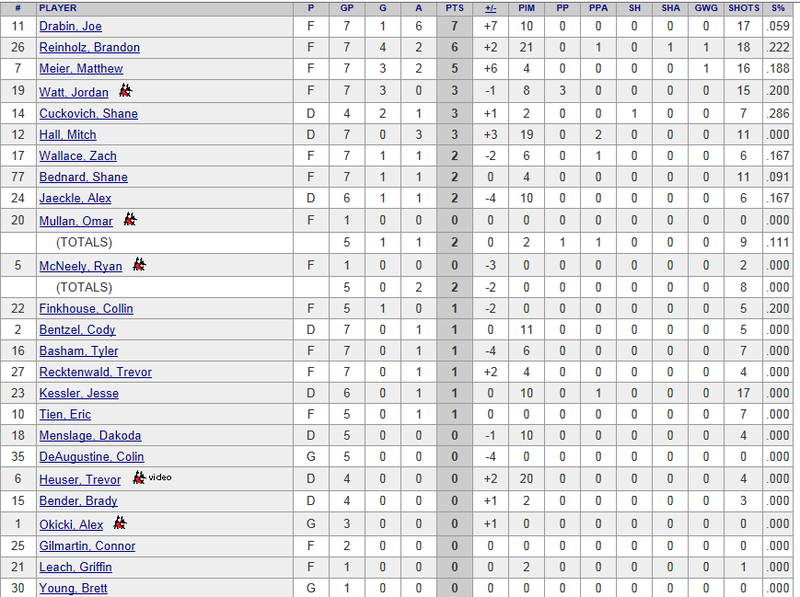 For Soo, they have the 22nd ranked power play and the 17th ranked penalty kill (6.3/84%). On Tuseday the Johnstown Tomahawks announced that they had traded returning forward Cody Gylling to the Amarillo Bulls for Omar Mullan. He helped Amarillo win the Robertson Cup last season. You can read the team's press release here. To us, Mullan looks like a great addition to the team. He brings scoring but he also brings a lot of toughness. The Soo Eagles are a different team than they were last season and so are the Johnstown Tomahawks. Johnstown has proven that when they play disciplined hockey they're a hard team to play against. If Johnstown can stay out of the box vs. Soo it'll give them a great chance to win. Tomahawks will have Omar Mullan in the lineup and also newcomer Ryan McNeely. It'll be fun to see what these two players are able to bring to the Tomahawks lineup. After this three game series, the Tomahawks will come back home and faceoff against the Springfield Jr. Blues. 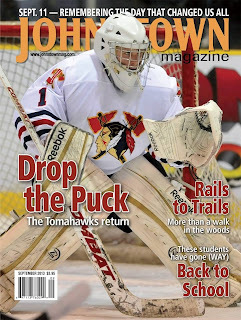 This is a new feature on TheTomablog were we are working with other writers throughout the NAHL North Division to bring you all the latest news, notes, and stories from the Johnstown Tomahawks' main rivals, throughout the 2013-2014 season. A new season has finally arrived after three long months and the Soo Eagle players and fans are ready for another season of NAHL Hockey. Before we get to this season’s trip to the Blaine Showcase, let’s take a quick trip back to last season. Last season, the Soo Eagles struggled through the Blaine Showcase, leaving Minnesota 0 and 4 to start the season with only one point from an overtime (OT) loss. Many thought perhaps the Eagles had made the jump to the NAHL from the Northern Ontario Junior Hockey League (NOJHL) too soon. The boys battled through adversity all season long and made it all the way to the Northern Division finals, only to lose to Jamestown. The Eagles started a new team with the majority of their veteran players coming from the Traverse City NorthStars, Kyle Froese (’94, D), Jared VanWormer (’92, F)*, Alexander Taulien (’92, F), Kyle Loridon (’93, F), Eric Rivard (’92, F), Chris Waterstreet (’92, F), Nathan Harris (’92, D)*, Zach Nagelvoort (’94, G)* and Jake Peacock (’93, F). In addition, the team had former NorthStars team member Tyler Marble (’92, G)* between the pipes. The Soo Eagles may have only picked up one win this trip to Blaine but they managed to pick up four points at the Showcase to start – two from their win and two from two OT losses. Any Eagles fan can only hope that means even bigger and better things to come from this diverse group of young men. One more win may mean one more step; like advancing to the Robertson Cup perhaps? This season, the Eagles return to the league with eight veterans, Paige Skoog (’94, G), Denver Pierce (’95, F), Matt Menta (’94, F), Kyle Loridon (’93, F), Mike Sabatini (’95, F), Michael Crowley (’94, F), Dante Suffredini (’95, D) and Pat Thompson (’93, F) as well as NAHL veterans from other teams, Colin Brennan (’95, Johnstown, G), Charles Hemstrom (’93, Wichita Falls, D), Ryan Urso (’93, Jamestown, F), AJ Jarosz (’93, Corpus Christi, F), Brad Pung (’94, Michigan, F), and Jacob McDowell (’93, Fresno, F). Fans this season can expect another great season of gritty hockey. The team has more returning NAHL veterans this season compared to last season and this is not the first season anymore, both of which could mean bigger and better things to come. The truth of the matter is, while we can compare the two seasons and their past and present achievements doing so is like comparing apples to oranges. But, if you ask me, “all is fair in love and hockey”… that’s how that quote goes, right? Truth be told, there are so many things that go into a team’s success beside the amount of veteran players and how they do at the Blaine Showcase. Things that also should be considered are talent, focus, and determination, just to name a few. Last season, the team as whole was determined to not end up at the bottom of the North division and they pooled their talent and skills and focused on what was important and what they needed to do as a team to get there. Together, with the coaches, they pushed pass the odds and all the naysayers to finish on top of the North in the regular season. It is also worth noting that the ‘12/’13 team added and dropped players a lot in their first season to get just the right fit. Be sure to keep up with all the latest Soo Eagles news here as the season progresses! Yesterday the Johnstown Tomahawks traded Jaycob McCombs and Ryan Bittner to the Minnesota Wilderness for Ryan McNeely and cash. McNeely is a '93 birth year player and had appeared in 4 games with the Wilderness registering two assists this season. Last season McNeely played for the Corpus Christi IceRays and was a teammate with current Tomahawks' defenseman Trevor Heuser. In 15 games with the IceRays, McNeely had four goals, two assist, good for six points and had two penalty minutes. He also appeared with the Fairbanks Icedogs in 32 games last season, scoring 11 points (2 goals, 9 assists). Before entering the NAHL, McNeely played for the Phoenix Jr. Coyetes U18 team, along side Cody Gylling. The trade sent newcomer Ryan Bittner to the Wilderness. Bittner played in three games for the Tomahawks and he did not record a point. Jaycob McCombs was in his second season with Johnstown. 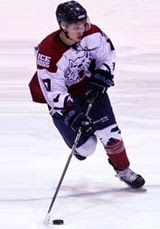 This year he played in all six games with the Tomahawks and had one assist. Last season he played 42 games in a Tomahawks jersey, scoring 8 goals, 7 assists, good for 16 points, and he had 61 penalty minutes. We have a new article on JuniorHockey about the Tomahawks finding their first wins at the NAHL Showcase. The article features quotes from Matt Meier and Colin DeAugustine. You can read it here. Today's was the last game for the Johnstown Tomahawks in the 2013 NAHL Showcase and they were able to beat the Bismarck Bobcats by a score of 3-1. After starting the season 0-3-0, the Tomahawks have now been able to get at least a point in their last three games, and are currently on a two game winning streak. At the start of the season the Tomahawks' penalty troubles and lack of having an effective penalty kill was most of their undoing. Though the team is still taking a few more penalties then they'd like, the players are killing penalties with authority and it's laying a good foundation to build momentum on. Today the Bobcats were 0 for 7 on the power play, and Johnstown was able to score a goal while on the penalty kill. That goal sealed the deal for the Tomahawks and gave them the two goal lead. It wasn't your typical short handed goal though. Most short handed goals happen when a defending player jumps on a mistake and either speeds down the ice for a breakaway or on an odd man rush. Shane Cuckovich picked up the lose puck and carried it to a few feet within the center red line, when he leaned back and fired a slap shot down the ice. Bismarck's goalie, Aaron Nelson came out to play it, when it quickly hit Nelson's stick and angled right into the empty net. It was a timely goal as the Bobcats were mounting good offensive pressure, and only one goal away from tying the game. The goal by Cuckovich, which was his second of the season, took the wind out of Bismarck's sails and was the goal Johnstown needed. Joe Drabin and Matthew Meier continue their offensive ways in this mornings game, each scoring a goal, and assisting on another. Alex Jaeckle picked up the extra assists on the first goal bring him his first assist of the season. The Johnstown Tomahawks went with Colin DeAugustine in net for the second straight game and you can't blame them after DeAugustine posted a shutout yesterday vs. the Adberdeen Wings. For close to two periods it looked like DeAugustine was not going to allow a goal and keep his shutout streak going. The only goal he allowed came with less than a minute to go in the second period, and was scored by Huba Sekesi out in front, at close range. Johnstown went 0 for 6 on the power play. Johnstown now has a record of 2-3-1 good for five points and second place in the division. After yesterday's game, the Johnstown Tomahawks' announced that current forward, Matt Meier has verbally committed to play for Air Force Academy. Air Force is a Division 1 hockey program. Former Johnstown Tomahawks' goalie, Chris Truehl is another player that is currently playing for Air Force Academy. Meier played a handful of games last year in the NAHL for Kenai River Brown Bears, where he was able to register five points in six games. So far this season with Johnstown, Meier has appeared in six games and has four points. The Tomahawks are expected to have more about this year's first college commitment later. When they do we'll make sure to pass it along. The NAHL Showcase is a wonderful event and gives each player the chance to play in front of a ton of college and pro scouts. The weeks after the event you'll read about all of the players that have made college commitments because of this event, and that's truly a wonderful thing to see. There is one problem that we have about the Showcase and it has nothing to do with the players, teams, fans, or anything on the ice. It's the attendance. Let us explain. During the NAHL Showcase each team will play two home and two away games. The league counts how many fans are at each game and gives the attendance to that home team. For teams that don't average that many fans at their normal arena, it will make their numbers, overall average wise, for the season look a little better. For teams like the Johnstown Tomahawks, it hurts their numbers. Today's game, the NAHL reports there were 345 people in attendance, and Johnstown was the designated home team. So that 345 will go towards OUR overall attendance. The game before the NAHL had listed the total attendance as 0, even though that wasn't the case. Guess what? That number goes into our average attendance numbers as well. The season opener at the War Memorial this season saw a crowd of 3,025. On Sunday the team had a crowd of 2,023. This means our average attendance should be 2,524. Instead, the league factors in the "0" showcase game, and the "345" game, dropping our average attendance to around 1,348 a game. If a game isn't being played in the city the team is from, and especially in the building their fans come to, it shouldn't be factored into that team's attendance. This is an issue that's been brought up before on other sites with everyone agreeing that the league should not factor in attendance during the showcase. In this age were teams stay or leave cities because of the average attendance and people who rating teams (and those team's fan bases off of average attendance), is something that shouldn't be factored in. For the die hard fans, they know the real numbers, but for the average fan, or someone not close to the game, the "wrong" numbers are all they'll see. 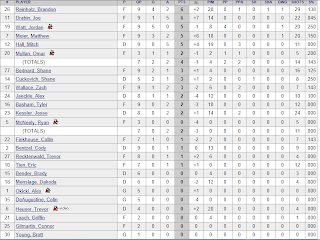 The NAHL needs to change this and it should be changed for next season and then from there after. What do you think? Let us know with a comment. The Tomahawks will now head to Soo to play three games next weekend. Of course we'll have a weekend preview later next week, and the big storyline that we're looking forward to is Colin Brennan possibly playing at least one game for the Tomahawks. Should be fun. The Johnstown Tomahawks played their first full 60-minute game as a team and in return got their first win of the season, 3-0. Colin DeAugustine was perfect in net for Johnstown as he posted the shutout. Johnstown's record now stands at 1-3-1 good for second place. Of course Johnstown will move out of the temporary second place spot once the other teams in the division play their games later today, unless everyone below them doesn't pick up at least one point. The Tomahawks' first goal of the game, and what would be the game winner, came off the stick of Brandon Reinholz. The goal is Reinholz's third goal of the season. The assist went to Joe Drabin. Johnstown would go up by two when defenseman Alex Jaeckle joined the rush and was able to beat Aberdeen netminder, Chad Chatt. The assists on the play went to Cody Gylling and Cody Bentzel. In the third period the Tomahawks took a few penalties and it looked like they might be in trouble, but for the first time this season their penalty killing was able to get the job done. In total Johnstown was penalized four times and was able to kill off all four Aberdeen power players. On the reverse side, Johnstown went 0 for 5 on their power play opportunities. The Tomahawks would score one more goal as Aberdeen pulled their netminder for the extra attacker. Taking a shot from just over the center ice red line, Cody Gylling was able to seal the deal and give Johnstown their first win of the season. Colin DeAugustine didn't face a ton of quality shots, but when he had to make a save he made all of them, turning away all 17 in the win. Last season the Tomahawks had a total of two shutouts. With the win DeAugustine's record improves to 1-1-1. The Johnstown Tomahawks battled hard today's game but fell in a shootout to the Topeka RoadRunners, 6-5. Johnstown was more disciplined in the game and their penalty killing was a little bit better, leading them to be able to pick least one point in the shootout loss. Johnstown has yet to play a great game this season and if they're able to play for a full 60 minutes they might be a tough team to play against. The Tomahawks played a hard first period out shooting the RoadRunners 12-6, and went into the first intermission with a 1-0 lead. The RoadRunners tied the game at one, a power play goal by Tyler Poulsen. Before the RoadRunners could celebrate tying the game, Shane Bednard put the Tomahawks' back up by one with a great individual effort, taking the puck from the goalie and beating him to the empty net. After going up 2-1 the Tomahawks' game fell apart. They couldn't build any offensive pressure and the goaltending seemed to not be able to make a save to keep the game close. Topeka would score the next four goals in a row and lead the game, 5-2. After the fourth goal by the RoadRunners, Jason Spence pulled Brett Young in favor of Colin DeAugustine. DeAugustine allowed the fifth goal before coach Spence called a time out. That time out was a key play for the Tomahawks' as it lit a fire under the team and got them back playing good hockey. In about three minutes time, the Tomahawks found a way to tie the game up at five. The game tying goal came from Shane Cuckovich, who played forward for today's game instead of his natural defensive position. In overtime neither team could score and the game went to a shootout. In the shootout the RoadRunners were able to beat DeAugustine all three times, while Johnstown was held scoreless. In the shootout loss, Johnstown picks up their first point of the season. Their record now stands at 0-3-1. Topeka outshot Johnstown 34-25 in the game. Brett Young played the first 41:15 of the game. He stopped 23 of 27 shots. DeAugustine then came into the game and played the rest of the way. He faced 6 shots and made 5 saves. In the first game of the NAHL Showcase tournament, the Amarillo Bulls beat the Johnstown Tomahawks, 6-3. Johnstown was more disciplined this game, but when they took penalties they weren't able to kill it them off as Amarillo went 5 for 7 on the power play. On the flip side, Johnstown saw themselves on the power play 11 times but could only score once. Johnstown did have a lead twice in the game. First they went up 2-1 with a goal from Matt Meir, and then retook the lead, 3-2, on another goal scored by Meier. Johnstown is now 0-3-0 to start the season. This time last year the Tomahawks had a record of 0-2-1. There's no need to jump ship just yet. If the Tomahawks' penalty kill was able to kill off their penalties they would have beat the Bulls 3-1. When Johnstown played 5 on 5 tonight, they owned most of the play, it's when the game went to special teams Johnstown began to have problems. This is something the players and coaches must figure out, and fast. In net for Johnstown was Colin DeAugustine, with Brett Young backing him up. DeAugustine faced 25 shots making 19 saves in the loss. There were no fights during the game but Brandon Reinholz was ejected in the third period for checking from behind. The player that he hit was not hurt on the play. 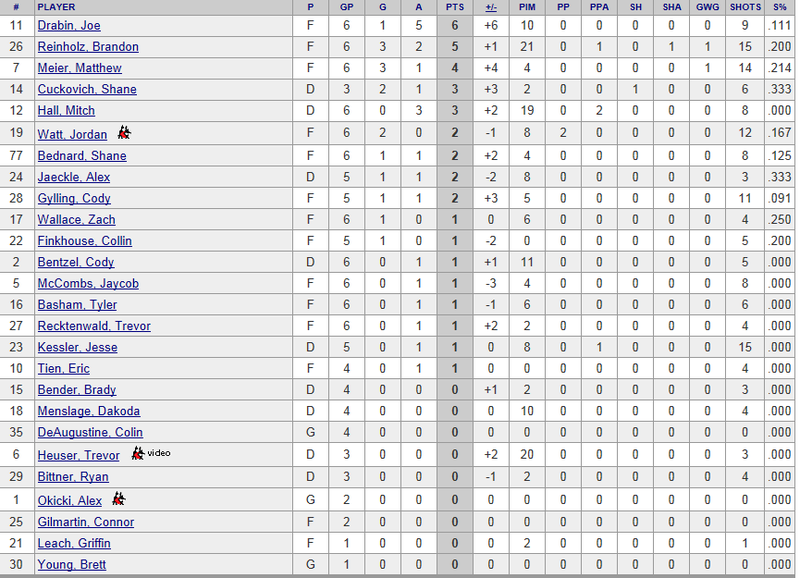 Meier, Drabin, and Hall all had two points in the game. The Tomahawks are back in action tomorrow at 4:30 CST (5:30pm our time) vs the Topeka RoadRunners. The RoadRunners have a record of 3-1-0 so far this season. We'd like to see Tien and Finkhouse play in the same game together. They don't have to be on the same line, just in the same game. We're guessing that Young will probably play tomorrow. The Tomahawks have a schedule that sees them at home a lot in the first half of the season. If they want good crowds, which we all do, the team needs to produce on the ice. The Tomahawks have scored five goals so far this season and have allowed 14. They also lead the league in penalty minutes with 109. The Johnstown Tomahawks got the season underway last weekend, and it didn't go the way they wished, as they were swept in two games by the Port Huron Fighting Falcons. Now the Tomahawks hit the road to play the next seven games on the road. Four of those games will take play at the NAHL Showcase Tournament in Blaine, MN. Last season, in Johnstown's first year, it took until the Showcase Tournament to get their first win in franchise history. This year they'll look to the tournament once again for their first win of the 2013-2014 season. On Thursday Johnstown will battle against the Topeka RoadRunners at 4:30pm. Friday the Tomahawks' will face off again the Aberdeen Wings, with puck drop set at 10:30am. The Tomahawks will wrap-up the tournament vs. the Bismarck Bobcats at 9:30am. Let's learn a little more about the NAHL Showcase, then we'll look back at last years games. We'll then take a look at the Tomahawks' opponents a little closer, see what our North division rivals will be facing off against, and then we'll wrap things up with some updated stats from the Port Huron series. So grab yourself a cold beverage and something tastey to eat and we'll get started. For scouting purposes, the five-day event from September 18-22, 2013, in which all 24 NAHL teams play four regular-season games, is a can't-miss for every NCAA program and NHL team as they get their first look at some of the best and brightest hockey talent North America has to offer. Located in the northern Minneapolis-St. Paul suburb of Blaine, Minnesota, the Schwan Super Rink is the largest ice arena of its kind in the world. The state-of-the-art facility, a $21 million project totaling over 300,000 square feet, features eight sheets of ice under one roof. With all its varied amenities and services, the Schwan Super Rink is absolutely unique in the world of ice sport facilities. 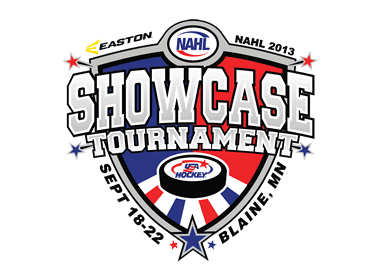 The North American Prospects Hockey League's (NAPHL) first event of the season, will again be played in conjunction with the NAHL Showcase Tournament. Entering its 5th anniversary season, the NAPHL is made up of 32 teams, 16 Midget Major and 16 Midget Minor that compete at the Tier I level. 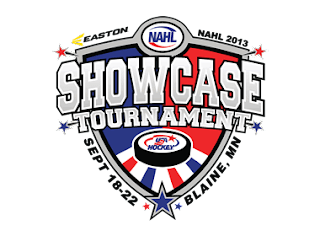 Traditionally, the NAHL Showcase Tournament attracts over 5,000 people in overall attendance, including more than 300 NCAA, junior and professional scouts. With the continued inclusion of the NAPHL, the High Performance Hockey League (HPHL) and the Upper Midwest High School Elite League that total is expected to reach close to 10,000 this year. Not only do you want the Tomahawks' to win as many of their games as possible, you want the players to play as well as possible because there is a great chance of them making college commitments. The first win in team history came against the Kenai River Brown Bears. The goalie in net for Johnstown was Chris Truehl. Cody Gylling was the only player to score in the shootout. The Bulls joined the NAHL for the 2010-2011 season after competing in the CHL (Central Hockey League) for nine seasons prior. Since joining the NAHL the Bulls haven't had a losing season and have compiled an amazing record of 128-30-7-13. So to say that the Bulls are a good team would be an understatement. Amarillo have a few additions to their lineup for this season that are familiar to Johnstown fans and players. Brett Szajner played 52 games for Jamestown last season. Brendan Vetter and Kyle Gattelaro both join the Bulls after spending last season for the Kalamazoo Jr. K-Wings. This will be Amarillo's first game of the season. This is the first time that Johnstown and Amarillo have played each other in franchise history. Today's game was a joke. The reason we say that is because the Tomahawks spent most of the game in the penalty box, some of which by their own doing and some of which coming from terrible officiating. 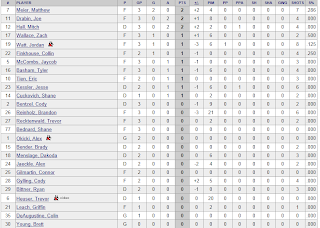 At the end of the day Port Huron went 4 for 11 on the power play and Johnstown went 0 for 4. Port Huron's other goal came shorthanded. The only Johnstown goal was scored by Collin Finkhouse, assisted by Shane Cuckovich in the second period, tying the game at one. For only the second time in his career, Cody Gylling was involved in a fight after sticking up for his teammate, Shane Bednard, who took a punch to the side of the head, knocking off his helmet. The fight didn't last more than a few seconds as both players fell quickly to the ice. Port Huron outshot Johnstown 34-23. We'll have a new post tomorrow over on JuniorHockey.com that takes a deeper look at all the action from this weekend in our "Weekend WrapUp" with series stats and much more. Johnstown couldn't get much going this game and will look to the NAHL Showcase to pick up their first win of the season. Newcomer Trevor Hesuer racked up 20 penalty minutes in today's game, getting into two fights during the game. 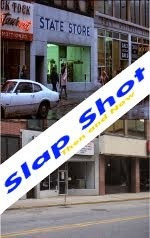 The story of this game was the amount of penalties called against Johnstown, and the lack of offense Johnstown was able to generate while skating even strength. Alex Okicki was in net for the loss. He made 29 save on 34 shots. Okicki now has a record of 0-2-0 with a GAA of 3.54 and a save percentage of .873. Max Milosek was in net for the win. He made 22 saves on 23 shots. Milosek improves to 2-0-0 with a GAA of 1.00 and a save percentage of .957. Just remember, it's only two games, and there's a ton of hockey to be played. Hopefully the team can pick up a couple of wins during the showcase and get on the right track. With that being said, things aren't going to get any easier as the Tomahawks' will face the Amarillo Bulls, the defending NAHL Robertson Cup Champions, in the first game of the Showcase. Griffin Leach was injured during the game and did not return. He left the game after taking what appeared to be a stick to the head. One of the big stories coming out of tonight's game between the Johnstown Tomahawks and the Port Huron Fighting Falcons is the fact that the opening faceoff was pushed back by more than a half an hour. This was due to the heavy smoke buildup that filled the War Memorial from the team's opening ceremony fireworks. When the game finally did get underway, the crowd of over 3,000 saw a pretty entertaining game. 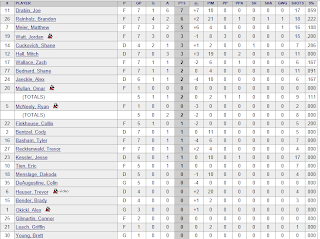 Unfortunately, at least for game one, too many of last year's storylines played out tonight vs. Port Huron. The first story line is obvious by the final score, we still have a problem playing against the Fighting Falcons. The second storyline is that we had a hard time staying out of the penalty box. In total Johnstown saw themselves with seven penalties against, while Port Huron only had two. Now yes, a couple of those calls weren't great, and some didn't go against Port Huron but at the end of the day (or game) they were still called. Johnstown was tied for 3rd in the league last season in penalty minutes. Hopefully this is a trend the team can stop moving forward. The third storyline was the Tomahawks having a tough time scoring goals. We'll give the team some leeway for now, as it's only the first game of the season. What I Expect: Janesville is a very interesting team. They are led by Air Force commit, goalie Austin Priebe, and returners Jordan Himley and Todd Koritzinsky. 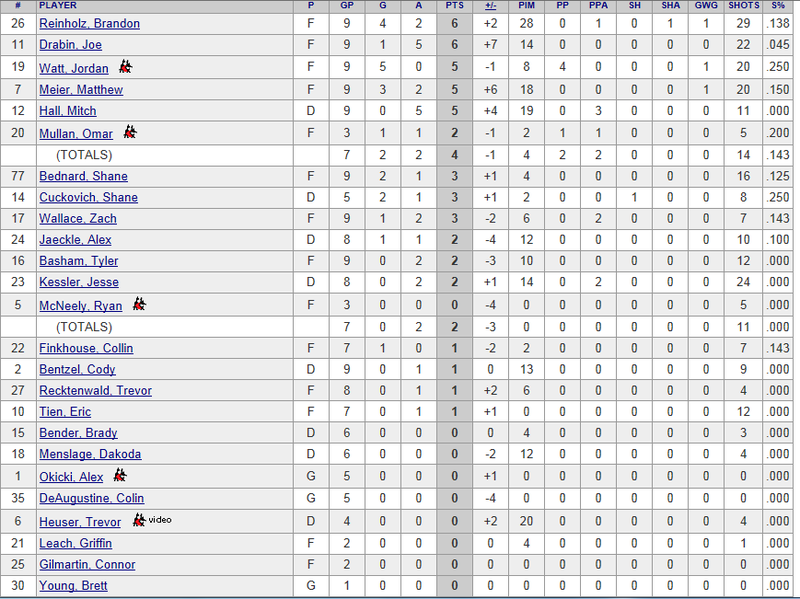 The Jets lost some leadership in Lemirande and Ford, but I expect players like Rehm or Tisdale to be locker room leaders. Among the new faces are Shattuck St.Mary’s product Nick Petrella and Wexford, Penn., native Michael Louria. Those are two players I think can step up and produce right away. Vance brings some experience and offense to the Jets defensive corps. Overall, this Jets team is once again shrouded in questions, in my opinion. How good can they be? What I Expect: I remember saying to various people last year, Michigan will come back as a solid team next year, just wait. Well, Moe Mantha found himself a formidable team. Mantha is tremendous coach and teacher of the game and his team will compete for a division title from the start. I am most excited to see Cuthrell and Pellegrino player. The two were Warriors' draft picks in 2013 and both can light the lamp. Cuthrell earned 47 goals and 41 assists in the NA3HL and I expect great numbers when he suits up for Michigan. Aside from the new blood, Michigan returns a strong nucleus. Jake Faiella, AJ Marcinek, Zach O’Hara, Brad Pizzey and Zack Szajner all return to the defensive and offensive teams respectively. Trevor Gorsuch and Dillon Kelley also return to give Mantha a solid one-two punch in between the pipes. All USHL teams are making their final roster cuts before the start of the season and one of those cuts was Cody Gylling from the Fargo Force. Gylling played all of last season with the Tomahawks and was the team's leading point scorer. In 57 games he scored 16 goals, 29 assists, 45 points, was a plus 5, and had 49 penalty minutes. Cody was drafted by the USHL's Fargo Force in the 6th round of this years draft. The Johnstown Tomahawks own Gylling's NAHL rights, which means if he plans to play in the NAHL it will be back with Johnstown, unless the team makes a trade sending his rights to another team. Being released this early in the week makes it a possibility that Gylling could rejoin the Tomahawks' this weekend in time for the season opener. With a tight group of players on this years roster, Cody wouldn't just be guaranteed a spot on the roster, he'd have to earn it. Plus if Gylling does return to Johnstown, that would put the roster at 26, forcing the team to make a roster move to get it back down to the mandatory 25-man roster. As the news breaks we'll keep you update. If Gylling does return to Johnstown, you then have to think, all the teams in the North, and possibly in the league, will fear Johnstown's fire power even more. Updated: New picture at the bottom of article. Uploaded 9/11/2013, 1pm. 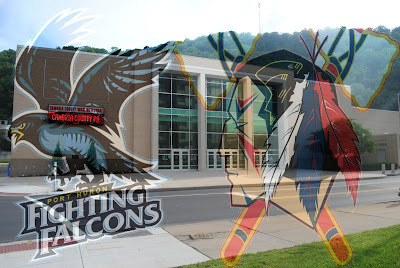 It seems like it has taken forever, yet, it also seems like it was just yesterday we all were at the Cambria County War Memorial Arena watching the Tomahawks battling the Fighting Falcons. Well it's that time again. A new season is upon us. We're officially at the start of the 2013-2014 season. The team is looking to be a contender this season, and the front office staff has a lot of great promotions and in game entertainment planned for this season. The first of course is opening night, this Saturday. We thought we'd put together a small article to keep you updated on the ticket sales for Saturday night's game. Last season, the building was sold out and hopefully WE can do that again this year. If you haven't gotten your tickets yet, or you know somebody that hasn't got their tickets yet, you can get them on of two ways. 1. Stop down at the War Memorial Box office. If you'd like more information on season tickets, flex plans, group tickets, luxury boxes, and anything else you, can visit the Tomahawks' website, or call the front office at 814-536-GOAL. We've included a few pictures which you'll see below. These pictures are taken from Ticketmaster's website and show the seating chart, and more importantly the seats that are sold, and the ones that are still available. In hockey, like every other spot, there are roster limits. In a perfect world a team would be able to carry as many players as they'd like. 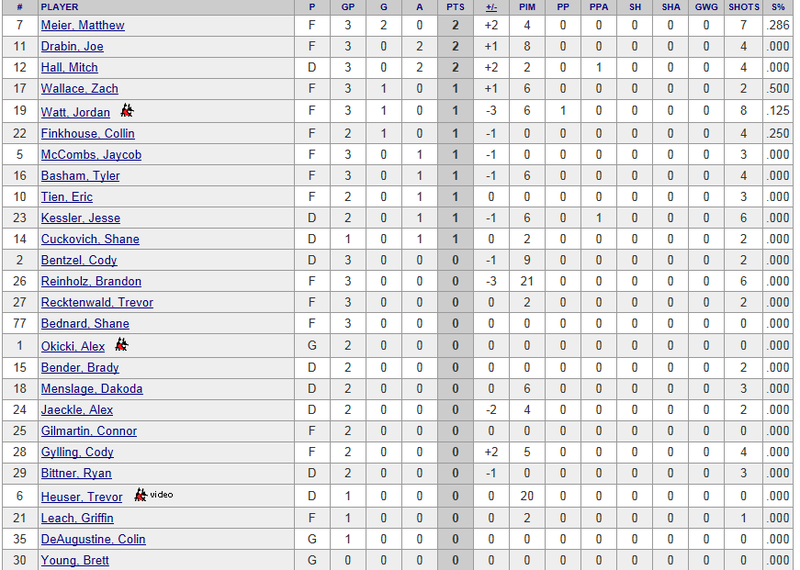 In the NAHL you can only carry 25 players for the first month of the season. The Tomahawks' were able to cut the roster down to 26 and then had a difficult decision on their hands, as to figure out who would be that last man cut. Somebody had to be the odd man out, and unfortunately it was Jake Fairchild. Fairchild played 47 games for the Johnstown Tomahawks last year and lead the team (and league) in penalty minutes (210 minutes total). Fairchild had one goal and six assists last season as well. Many would find it hard to believe but prior to last year, Fairchild had never fought in his junior hockey career. As would be the case with any player being told they didn't make the roster, Fairchild was upset with the news. Instead of leaving in a rage, or trying to find somebody to blame, Fairchild has gone to work. A Tomahawks' player at heart, Fairchild has remained in Johnstown, doing everything he can on and off the ice to regain a roster spot. Right now, it appears that Fairchild is on the wrong side of a numbers game, that all teams have to play. 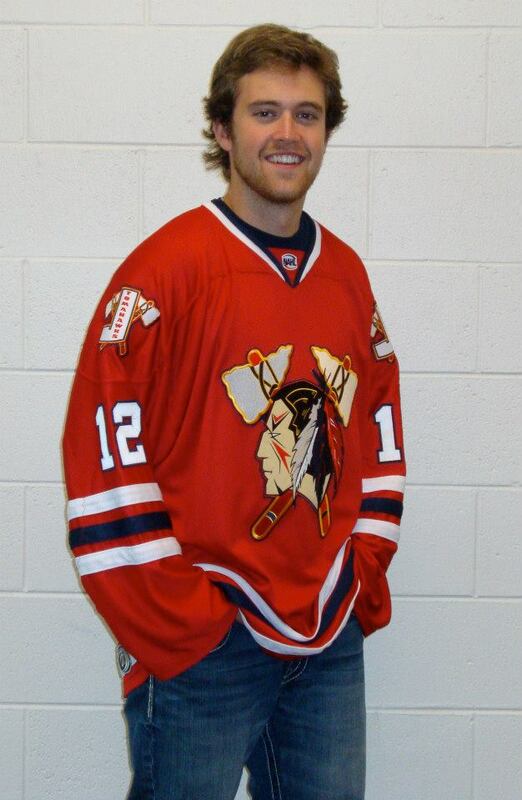 Injuries, poor play, could see Fairchild back into a Tomahawks' jersey. Another possibility would be a trade. The Tomahawks are defensemen heavy right now, and with the team's struggles last season to score goals, the team might look to add even more offensive power. Only time will tell, but don't rule out seeing Jake back with the Tomahawks this season. Update: We have a new post on JuniorHockey.com and have information about Jake Fairchild, as he signed with a another team in the NAHL North Division. The title says it all. 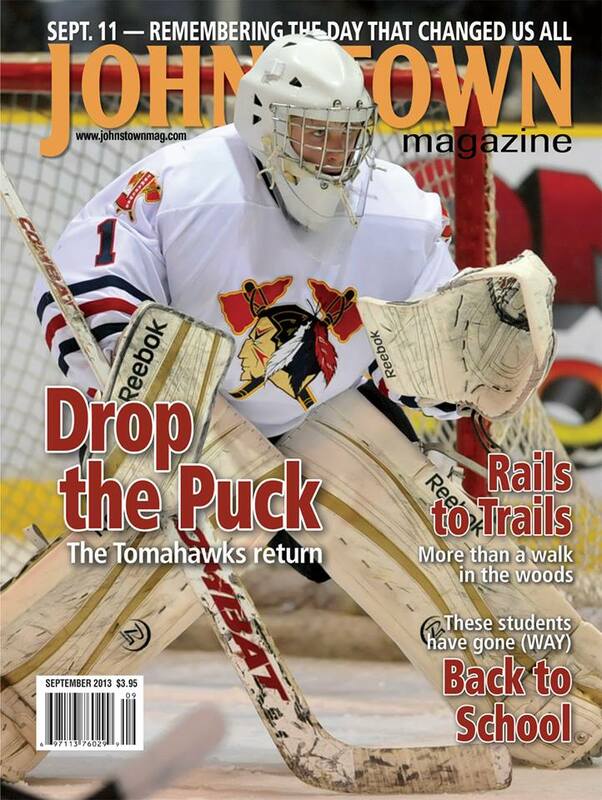 The September issue of Johnstown Magazine has a good article about the Tomahawks' and the upcoming season, which starts on September 14th. The article has quotes from Head Coach, Jason Spence, Tomahawks' defenseman, Cody Bentzel and forward, Shane Bednard. Here's the link to the Johnstown Magazine homepage. You can also check them out on Facebook. For those in Johnstown you can stop by the Tribune Democrat to pick up a copy, or at any of these other locations. For those outside of Johnstown, you can get a subscription for $24 a year, here. Tomahawks start the season vs. the Port Huron Fighting Falcons, at home, September 14th and 15th.